Josh Cole scored twice for Stockton against AFC Rugby. Stockton concluded their pre-season with a 3-1 success over visitors AFC Rugby and manager Scott Easterlow admits he has some tough decisions to make ahead of their Coventry Alliance opener. 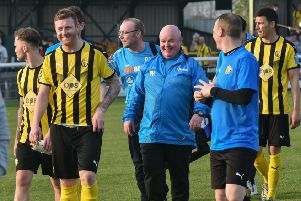 Stockton began their top-flight campaign at home to Ambleside on Saturday and Easterlow said there will be some disappointed players when his starting XI is announced. “I feel we’re ready,” said Easterlow. “AFC Rugby were the best footballing team we have played in pre-season and I will be surprised if they are not close to winning the division below ours. “I will have some tough conversations/decisions to make this week. “Obviously I can’t pick everyone in the squad but it’s a good headache for me to have. Stockton found themselves behind to Rugby in the 15th minute following a mistake from Joe Carter. They should have been level on the half-hour mark but Stefan Grudzinski was unable to head home at the far post when it looked easier to score. Mike Ellis did get Stockton back on terms five minutes before the break and the home side took the initiative after the interval when Josh Cole cleverly fired a free-kick under the jumping wall and into the net. The substitute then doubled his tally when a mishit shot from Elliot Parasmo fell kindly for him to fire into the roof of the net. Keeper Michael Moreton preserved the hosts’ two-goal cushion with a smart save at the death.